It’s been a week that I’ve had my old and new Halloween decorations up in my apartment (click here for last week’s post). 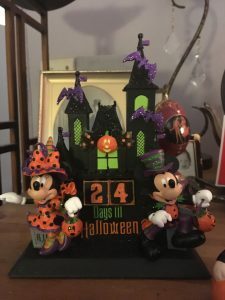 I was most apprehensive about the Halloween countdown calendar figurine that I gave Ben, and I was prepared to return it to its box if it was too emotional to display it. Ironically, I find great comfort and connection to Ben when I dutifully change the number of days remaining till Halloween. I can see Ben’s smile and I feel like I am doing this for and with him, taking pride in the knowledge that it is a gift that he absolutely loved and that brought him joy at a very unjoyful time. I’ve been thinking about how is was the first time in the three years since I lost Ben that I was ready to have any Halloween decorations. I cannot explain why, at this point in time, the countdown calendar figurine gives me a sense of connection to Ben in a good way and yet, other things continue to upset or unnerve me, conjuring the memories of the pain of loss. I’m still not ready for some of the items in our collection and I don’t know if I will ever be ready for the things that I brought to decorate Ben’s hospice room. Only time will tell. But, should there be a time limit at which point I should without a doubt be able to cope with all of this? They say time heals all wounds. When it comes to grief, I think time helps you adjust to and learn to coexist with the grief. 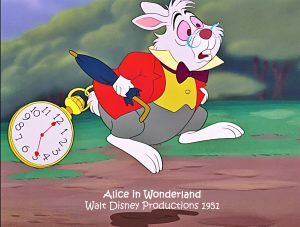 The White Rabbit in Disney’s Alice in Wonderland says, “I’m late, I’m late, for a very important date.” I have felt like that as I have dealt with grief, except that I never knew what date to set or if, in fact, any such date exists. There is always the sense of measuring how long it will take to get past the pain. When loss was very new and raw, I simply wanted just to get to a point where grief became easier. When I wasn’t wondering when I would feel better, or if I should be feeling better than I did at any given time, other people were placing a time stamp on my grief. There are always the people who remind you that it’s time to “move on,” which is one of my least favorite expressions. Those dates have been based on their own experiences and opinions, and sometimes even on their own comfort level with my grief. The thing is, everyone handles grief differently and in their own timeframe. I have always asked myself if I’ve been handling grief well. I ask myself if I should still have such a hard time celebrating Halloween without Ben. Time has allowed me to joyfully embrace some memories but not others. Should it be different? Have I missed a deadline for grief to subside? I really don’t know. On a day to day basis, although I have bad moments and bad days- especially on milestone dates- I feel like I am functioning just fine. I have always been a person who cries easily, so I cannot measure grief by tears. Still, I constantly question and assess myself. To me, the fact that I made the decision to welcome Halloween this year is a good sign of progress. It seems okay to me that some things are easier than others. I test myself, as I did with Ben’s Halloween countdown figurine and, sure enough, it is actually making me happy. If I’d decided that I was not yet prepared to display any Halloween things, would that have been okay, too? Should I be rushing or worrying that I’m late to coming to terms with my new life and new normal? How long should grief last? How can we say? Grief began the day Ben was diagnosed with ALS. We grieved our life as we knew it, we grieved the future that we wouldn’t have, we grieved each ability that Ben lost as a result of the disease. After he left this world, I grieved his loss, and I grieved the loss of purpose that I had as his caregiver. This weekend, I was reminded that for at least a year after Ben died, each time I did venture out into the world to socialize, I cried on my way home. I remember that on one of my first outings, I cried on my way to the subway, because in addition to missing Ben, I also realized that being alone and returning home by myself had to be my new normal. It also scared me that no one would even know if I arrived home. It took me more than a year to begin to establish routines. I tiptoed into life, testing the waters to see what felt comfortable, worrying that I was not progressing quickly enough. On Friday night, after attending a Broadway play, I walked to the subway and thought about how I have become more comfortable with my new normal. I don’t experience the same pains and anxiety to return home alone. I don’t love it, and I do hope that one day I will find love again, but I embrace the good and bad days and moments simply as part of life. I see a lot of comments on support groups from people whose family and friends make them feel like they either haven’t grieved long enough or they’ve grieved for too long. As I see it, there is no such thing as an appropriate time to grieve. That said, I did seek therapy and join grief support groups after the loss of my mom and of Ben, because I felt like I needed support with getting back to living. I think it’s perfectly appropriate to seek help if you feel that you need support to function in a manner that you think is appropriate and that gets you from day to day. It was helpful to me to talk to others who were in a similar circumstance, though it did at times fuel our insecurities to compare our experiences coping with grief. People have asked me if I often still think of Ben. Yes, I think of him every single day, and I often talk to him and about him. It feels right to me. Some people feel that I shouldn’t still be thinking of him so frequently because it’s dwelling on the past and it keeps me from “moving on.” Frankly, I am not moving on and leaving Ben behind. I am moving forward, continuing to live but having been shaped by my love for and experience caring for Ben. Some widows and widowers share my experience and others say they don’t think about their spouses as much anymore. I’ve heard people make negative comments about those who have lost spouses and have found new love within several months. I am not aware of any formula or correct answer to any of these situations. There should be no judgment, and if there is, please keep it to yourself. 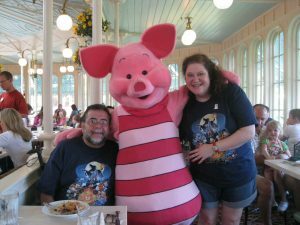 I have not wanted to return to Walt Disney World without Ben, although I do miss it. I still cannot imagine attending the Halloween festivities without him because that was truly our time, even marked by his proposal one Halloween. But, I don’t rule out a return. In fact, I do feel a tug of wanting to go and to feel the connection to Ben at a time other than Halloween. I guess I’m not like the White Rabbit. I’m not setting any dates or deadlines on how I deal with grief and its integration into my life. I have not set a deadline for myself and I will not accept a deadline set by anyone else. There are times that I feel that I’m not where I should be, and at other times I feel like I cannot rush myself, following my emotions and experiencing life on my own terms, and although I’m not always steady on my feet, I’m stepping forward every day. In my opinion, White Rabbits around me can turn off the alarm and relax , because when it comes to coping with grief there is no finish line, because it never completely passes. What’s more important than deadlines that I might have missed is that, in my own time and in my own way, I am more welcoming of the creation of new memories. I’ve been reminiscing about Pooh and Piglet played a big part in how Ben won my heart. When Ben and I first started dating, we often walked to the flagship Disney Store on Fifth Avenue in Manhattan. It is no longer at that location. We wandered the 3 floors and I often left with little gifts- the courting phase of a relationship is fun, indeed! 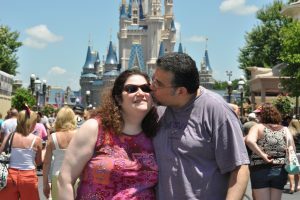 Having spent increasing amounts of time with me, Ben was becoming fully immersed in the Disney mindset, and loving it, sometimes to his own amazement. One day, as we strolled through the store, Ben called me over to look at a figurine, exclaiming, “Abby, look! 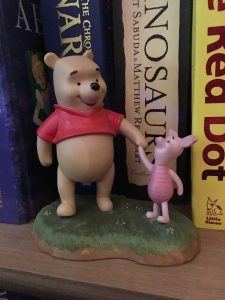 It’s Piglet and his best friend, Pooh!” I stared at him, speechless, and then started to laugh. He shook his head, laughed, and said, “I was macho before I met you!” Truth be told, he was not so macho. He was a big teddy bear, and his great hugs could calm me down and completely surround me with love. He was a big kid at heart who indulged my inner child, and that was us. He bought me that figurine as a surprise, and it will always be so special to me. When I saw Piglet and Pooh together in the film, I couldn’t help but picture Ben smiling. They have a such a beautiful, sweet friendship. Here’s one little conversation between them that touched my heart. That’s caregiving. It’s that simple and that complicated. Ben didn’t feel like himself as ALS took away his abilities. There were times that he was understandably frustrated and sad. All I could do was be there, trying to bring him comfort. Sometimes it’s a matter of being present, sometimes it’s being a good listener, sometimes it’s ensuring that routines- including medications- are followed. Mostly, it’s about caring to figure out exactly what will soothe the caree at the moment. For Pooh, honey was always a good solution. It’s not always that easy. But communicating the desire to be there, to help and support, can only strengthen a bond. Although we could lose patience with each other, and sometimes we both needed our moments to feel down, Ben knew that I would always at least try to find the thing that would be his tea and honey. And, I knew that he would find a way to show me he loved me. Halloween 2011. 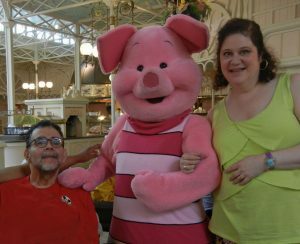 Piglet was bigger than we’d imagined! It’s hard to imagine that any day with ALS can be a favorite day. There were definitely the big time highlights, like when Ben woke up on January 1, 2015, and he said that he had such a fun New Year’s Eve. I had ordered matching Mickey Mouse and Friends pajamas for us and even for my cat, Disney. Ben always loved the fireworks at Walt Disney World, and I found a toy that supposedly simulated fireworks, with sound effects and LED light “fireworks” that were activated by a remote control. We played the soundtrack to the “Wishes” Magic Kingdom fireworks show and Ben chose the sequence for our fireworks show while we had our photos scroll on his computer. It was pretty hilarious to pretend we were at the Magic Kingdom as we watched these pretty unconvincing fireworks splash on the wall. It felt almost magical to laugh and enjoy the evening. That silly celebration was a most favorite day and is now part of my treasure trove of beautiful memories of moments sprinkled with pixie dust. 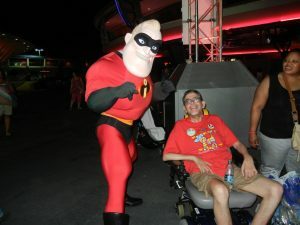 Any days spent at Walt Disney World were favorite days when Ben felt free as he rode around in his scooter or electric wheelchair. The Disney magic allowed him to enjoy most of the attractions and to temporarily abandon his worries. Once he was homebound, Ben’s days did not vary much. But, every day that he was okay and things went smoothly, when we handled or averted a crisis, solved a problem, and enjoyed each other’s company, was a favorite day. We recognized, acknowledged and treasured those. 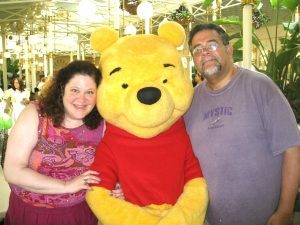 Winnie the Pooh commented, “There’s always time for a smackeral of wonder.” I think that’s true. And, it’s so important. Ben never lost his curiosity, sense of humor and ability to be inspired, particularly by music. 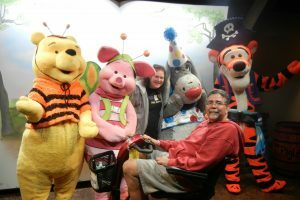 When we were able to go to Walt Disney World, his inner child shone, and he marveled at everything he saw and all the music he heard. When he was home, he watched movies and documentaries and listened to music, always questioning, always learning, always with a sense of wonder and delight. I think that helped him to navigate ALS. Always finding time for a “smackeral of wonder” is good advice for all of us. I believe that Ben would be especially happy that these lessons came from Piglet and his best friend, Pooh. I guess aquatic life has been on my mind since my little jaunt to the Georgia Aquarium and found Nemo and Dory and had so much fun with the sea otters, dolphin and penguins. 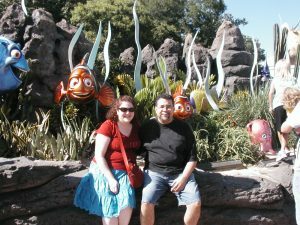 Nemo, Dory and their friends helped me put into perspective a lot about caregiving and life. It’s not all about “just keep swimming!” but you can read about how that quote inspired me by clicking here. Some of the best help and support you receive will come from unexpected sources. 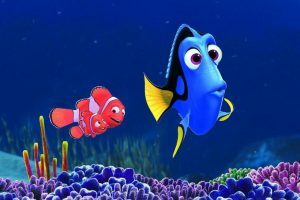 Dory felt alone because she thought she would never find her mom and dad and have a family. 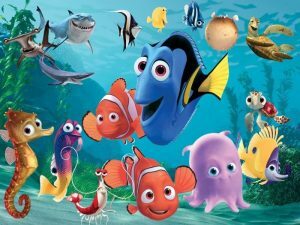 She finally realized that Nemo and Marlin were also her family. My friends are my family, too and they provided help and support for which I will always be grateful. So did some of the professionals who took care of Ben, and I will forever love and be grateful to them as well. 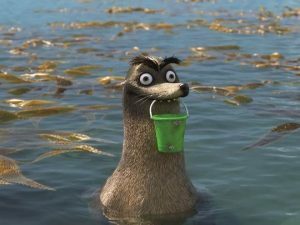 Becky and Gerald may have seemed like they were not up to the task of helping Dory and her friends, but they also came through in big ways. Don’t automatically judge or dismiss people, especially if they genuinely want to help, because they may be the very people who will listen, assist and offer really good ideas and information. Teamwork happens in many ways. All kinds of people stepped in surprised us in wonderful ways throughout Ben’s illness, and they continue to do so. They have compensated for the people who disappointed us, because, of course, there’s that, too. Knowing that Ben was in the hearts of many always touched me, and it still does. Never underestimate the power of compassion and always be open to delightful surprises. 2. Be careful of the undertow. Caregiving is overwhelming for so many reasons. Aside from the demands of the job, there is an emotional toll of helping someone you love deal with any disability or illness and watching them struggle. The “undertow” can take a caregiver and/or a caree to a place of extreme sadness, depression, loneliness and helplessness. It’s important to stay connected to the outside world, through your own network of friends and relatives, outside agencies, and social media support groups. Make lists of things and/or people that provide comfort, cheer, or assistance when the undertow starts pulling you down. Illnesses are unpredictable and caregiving needs are unpredictable. Our moods are also unpredictable, particularly when we are stressed, exhausted and our Tangled emotions are turning us Inside Out (what can I say? Disney references work for me!) You have to be ok with crazy when many things are happening at the same time that you have many conflicting emotions. And, you have to be ok with crazy when attempting to handle crises. I remember thinking that crazy was my new normal. Perspective helps! So does humor. 4. Not everything is easy to do, but there is always another way. Creativity, resourcefulness and a good sense of humor can help to determine new approaches and perspectives on how to deal with issues. Don’t be afraid to ask for help. In the most planned and organized day, there will be crises. They can be physical issues but they can also be emotional fallout. Caregivers and carees are not always at their best, though we would like to be. It seems to me that our default answer to “how is everything? “ is “fine” and I’ve found that most people kind of want that answer because they don’t know how to handle anything else. I have heard people with ALS and their caregivers says that it irritates them to be asked that question because people really don’t want an honest answer and they don’t want details. And, they don’t want to feel obligated to do anything, even if there is no expectation of that. It’s ok to admit that things aren’t fine. That admission should not invite any judgment. And, it doesn’t mean that things won’t be fine again, even in a matter of moments. Remember, Hank taught us that we’re ok with crazy! 6. 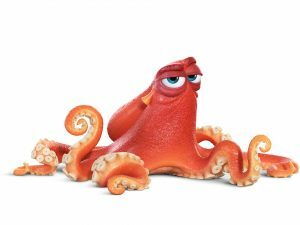 An octopus may have 3 hearts, but it doesn’t mean it’s nice. Yes, it’s a fun fact, but it also lends perspective to our expectations of people around us. Ben and I were very fortunate to have lovely people around us, but we also learned that not everybody has a big heart, and having three probably would not have helped them either. Also, professionals are there to help, but, like all humans, there are more and less helpful and invested people. We were surprised in good and not so good ways. 7. Let someone know you love, care about and value them. 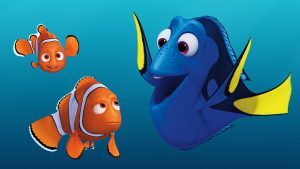 Marlin often gotten frustrated with Dory, but he realized that in her innocence, she was fearless and she got him to do “crazy things” like jump jellyfish and outsmart sharks to help find Nemo. 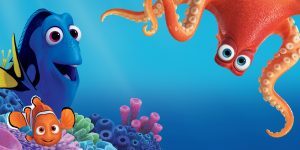 His approach to problem solving became asking himself what Dory would do. 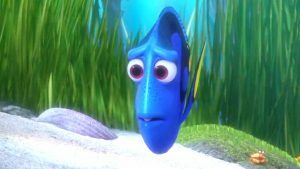 In the film, Marlin apologizes to Dory for not having told her how much she did for him. That’s not a regret anyone wants to have. Take any opportunity to share kind and loving moments and memories. The frustrations and resentments will ebb and flow, but the appreciation and love we have for each other should always flow. We certainly need to have plans in place, and even back-up plans, but when you’re dealing with illnesses and caregivers, you’re also dealing with human beings and unpredictable factors. For example, I prepared to go to work every day, but there were days that I had to stay home at the last minute for a variety of reasons. I remember that on some of those days, my feeling Ben’s very loving appreciation and his feeling my unwavering devotion, made for beautiful days. You know you have to be prepared for anything, but expect the unexpected in good ways, too. 9. You can do whatever you put your mind to. 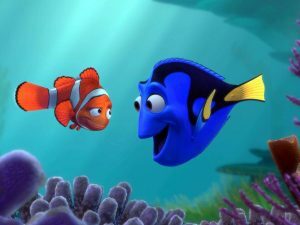 Dory may have suffered from “short-term remembery loss,” but she dove in and figured out what she needed to do to find her parents. She enlisted her friends to help her and remained determined. She didn’t give much thought to consequences, which did create some problems for her along the way. But, she forged ahead. Caregiving can be very overwhelming at times, in terms of the actual tasks and in thinking about the future. 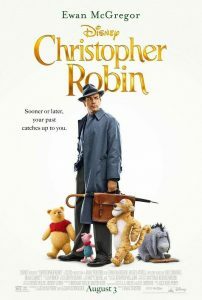 But, I always come back to Christopher Robin’s wise advice to Winnie-the-Pooh: you are braver than you believe, stronger than you seem, and smarter than you think. 10. Never underestimate the power of a cuddle party! 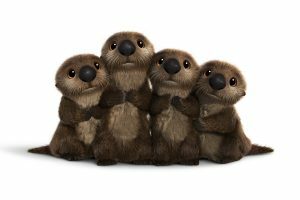 I am kind of obsessed with river and sea otters, so those litter critters stole my heart in the film. But, they are a strong reminder that a little bit of whimsy, sweetness, and cuteness can lighten any moment. For Ben and me, that often came in the form of generally anything Disney. My huge collection of Disney toys to cuddle didn’t hurt either! I have added a couple of cute little otters to my collection. They all comfort me now in grief, too. 11. Sigourney Weaver rocks! You need someone like her on your side! Once again, I am faced with the conflicting emotions of joy that school is over for the year, and sadness over the memories of the summer of 2015, Ben’s last summer. We spent it in the hospital, where he ultimately succumbed to ALS. Today, July 6, marks the third anniversary of the day that Ben had a respiratory crisis and we ended up in the Emergency Room at Mount Sinai Medical Center. 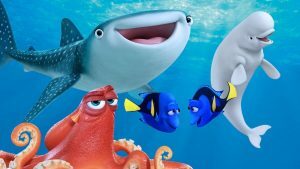 As I write this post, I am cuddled up with Ben’s favorite Disney throw, with Sully and Mike from Monster’s, Inc and personalized with his name. I covered myself with it last night, too. On these kinds of anniversaries, I refer back to my blog post from last year year. I can’t say that much has changed- it remains a somber day when I prefer to be by myself with my thoughts and our photos, and maybe watching Monsters, Inc., which always gave him such delight. For me, this is simply the date when everything changed. I woke up this morning thinking about how I woke up on this date three years ago and Ben said he could not breathe. I think of how we waited for the ambulance, not knowing what would happen. How ironic it is that today is International Kissing Day, because on that day he was connected to a ventilator and his mouth was covered with the Bipap mask. For the next few weeks, before he agreed to a tracheostomy, our way of kissing was to blink our eyes tight and then I would throw him a kiss- he couldn’t use his arms or hands to throw one back. I remember that despite the frenzy of an Emergency Room, it did not occur to me that I could lose Ben at that time. I was kept very busy as the health care proxy and the only family member present. I emailed and texted his family and our friends and answered a lot of questions. I tried to stifle resentments towards family who had lots of questions, suggestions and judgments but had never been there for him as his ALS was progressing. I was surrounded by people but felt very alone. I talked to Ben but had difficulty reading his lips through the mask. And, he slept a lot, leaving me to my own thoughts about what would happen next. I shared all of this in last year’s post. I did not make any plans for today, not knowing how I would feel, but allowing myself to be okay with anything I chose to do. I have learned that I cannot predetermine what’s right for me in these circumstances. I don’t want to hear that I should keep living, or I should make plans to distract myself, or that Ben would want me to be happy. Sure, it’s all true, but it doesn’t matter. Today, my head is swirling and I just want to think about Ben, and that day. It’s an odd feeling that nobody else would even remember this date, and I wouldn’t expect them to. That does, however, underscore that when this crisis hit, it was just Ben and me. And, as awful as it was, I was there for Ben, he knew he could rely on me, and there was a lot of love and trust. We may not have been a real Disney prince and princess, but the profound love and caring that we expressed throughout his experience with ALS gave special meaning to the lyrics of So This is Love, from the original, animated Cinderella. Yesterday, I went for a walk in Central Park. I love walks through the Park, despite the heat, because I have my music in my ears and I can let my thoughts flow. I have my route, and I headed for Belvedere Castle, from which you can look down and see lots of turtles. Ben and I loved turtles and a turtle was his icon in the original messaging program that we used. I was shaken to find that the Castle was under scaffolding and closed to visitors. It was so important for me to see those turtles yesterday because of today’s anniversary. Not knowing what to do, I proceeded on my walk and was lured to a little gazebo that was right on the water. I had never walked there before but I was drawn to it. There I saw several little turtles! I do look for signs that Ben is with me, and this was my sign. I took many pictures and just watched them for a while, talking to Ben in my head and knowing that we would have been so happy to have discovered them, at the same time feeling that he was with me. Further on in my walk, I found the fountain that I never seem to be able to find when I’m looking for it. I tossed some coins and made wishes (see my post on wishes), shedding a few tears. I try my Disney best to be optimistic even when I’m sad. Sure enough, when I walked to the water by the fountain, I saw more turtles and even some fishies. I have never seen so many turtles at the Park, and I believe that they carried the message that Ben is watching over me and that even as I keep moving forward, he will maintain a presence. This date may always be a difficult day. In my mind, it will always be thought of as the day that everything changed. I see all kinds of social media posts about International Kissing Day and I think that it was the first day when I couldn’t kiss Ben. I do notice that the intense and debilitating grief has shifted. I know that today’s fog will lift, and that I will also remember days in the hospital that, despite the devastation and horrible decisions, were filled with kisses and with love, music and even laughter. Just not today. 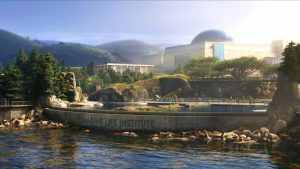 With every Disney film release come thoughts of Ben, but a film like The Incredibles 2 is particularly bittersweet because of Ben’s love of the original film. Mr. 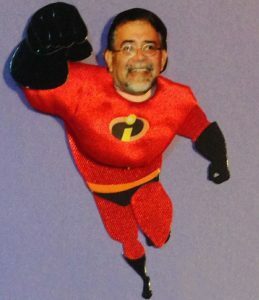 Incredible was one of his top three Disney buddies, along with Buzz Lightyear and Sully. Because of this, and since it was our tradition, t was especially important to me to see the film on opening day. Of course, I had my little cry in the theater as the film began. There are times when I literally feel Ben beside me, which I know some people find strange, but at this film I didn’t feel his presence. I did, however, profoundly feel his absence. I was angry that he did not have the chance to see this movie. I don’t usually feel angry, though I do often feel frustrated that he was cheated of so much of life. There are certainly more profound life moments that he is missing and will miss that I should probably be more angry about, but sometimes the little moments make a tremendous impact. Interestingly, the quote that resonated with me was very appropriate for caregivers, and for an opening weekend that included Father’s Day. Edna Moda told Mr. Incredible, “Done properly, parenting is a heroic act. Done properly.” I was so fortunate to have had two devoted and loving parents. As a public school teacher, over the years I have seen many children who are not parented properly, in fact, they are barely parented at all. Good parenting is indeed a heroic, selfless act of love. The same came be said for good caregiving. As a caregiver, I often questioned my abilities, especially when I was struggling with exhaustion, sadness and patience with Ben when he was stubborn and demanding. But, like any other caregiver, I put my emotions and feelings aside, or, at least on hold, and trudged on because the immediate needs of caregiving are not negotiable. Phone calls abruptly ended, activities were thrown to the side, chores ignored (well, I can’t say I minded that very much) as I attempted to create order amidst chaos, calm when he was panicked, and peace amidst the devastation of watching Ben deteriorate and suffer, physically and/or emotionally. Like all caregivers, I also ran interference among medical professionals and other related staff, as well as family and friends. I provided spirit boosts and levity and also administered difficult doses of reality, as tactfully as possible. It certainly wasn’t my goal as a caregiver to be heroic and I don’t think that caregivers generally perceive themselves as heroes. 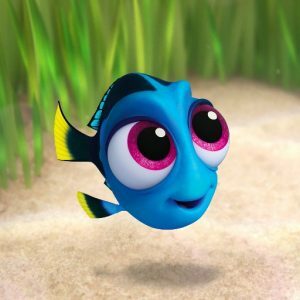 We probably spend more time following Dory’s advice to “just keep swimming.” As a crybaby, I’ve never seen myself as heroic- at any point in my life- which is why, I think, I was puzzled when people told me that I was brave. Ben was brave, I was along for the ride, trying to be helpful and, a good deal of the time, not sure if I was much of a success. My insecurities made me feel much less than a superhero. However, I can attest that I definitely earned the Wonder Woman t-shirt Ben got me after I managed to grab him and keep him from falling off the bed! 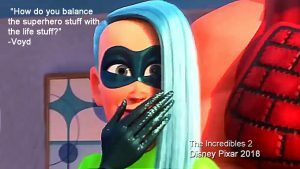 In the film we are introduced to new super hero, Voyd, who asks Mrs. Incredible/Elastigirl, “How do you balance the superhero stuff with the life stuff?” Indeed, that’s a very important consideration for caregivers. For me, I constantly struggled with balancing the responsibilities of caregiving against a full-time job, daily life chores, relationships with friends and family, the emotional strain of losing the life Ben and I had, and knowing that ultimately, I was going to lose Ben. In retrospect, I think the balancing act IS the superhero stuff. Young Dash tells his dad, Mr. Incredible, that he wants to fight bad guys because “It defines me.” I can say that caregiving defined me for several years and I found that it is a significant part of who I am and how I see myself. I have written about how I floundered when I was no longer a caregiver, until I found myself again through blogging, volunteering and trying to support other caregivers. Although I would rather not have discovered this through the illness and loss of my dad and Ben, I feel like I have identified caregiving as my super power. Unfortunately, I was not able to defeat cancer or ALS, but my dad and Ben always felt cared and advocated for and loved, and that is incredibly powerful. I did not see it while I was actively caregiving, but time and distance have provided valuable perspective. Mr. 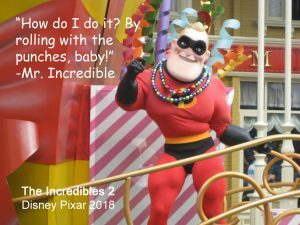 Incredible at Walt Disney World’s parade, 2014. Mr. Incredible summed up well the life of a caregiver when he said: “How do I do it? By rolling with the punches, baby!” I can picture Ben smiling and nodding, because, in actuality, both he and I rolled with the punches. I am still in awe of how well he rolled with the severe punches dealt to him by ALS. I guess we were both super heroes, albeit without the cute costumes. 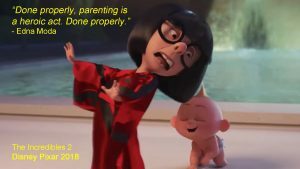 I highly recommend The Incredibles 2. It’s quite fun and fantastic and offers unexpected words of wisdom for caregivers and everyone else. Post your thoughts! I look forward to reading them.